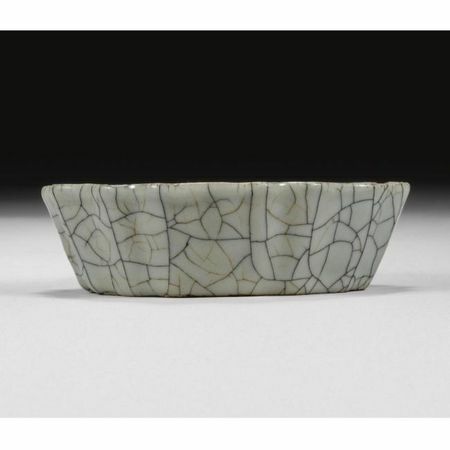 NOTE: The delicate potting and glaze that thins at the rim to reveal the black body with a prominent crackled effect are characteristic of 'ge' wares produced from the Song dynasty into the Yuan period. 'Ge' is a connoisseur's term known only from post-Song texts and does not refer to a production area. It is used for ceramics similar to 'guan' wares but with a more opaque buff glaze as seen on the present washer. The crackle effect is distinctively stained black interspersed with some secondary rust-red or light-brown crackles. Nigel Wood in Chinese Glazes, London, 1999, p. 87, notes that it appears likely that both the 'ge' and the 'guan' wares wares issued simultaneously from the same kilns showing the natural variations of atmosphere, temperature and cooling that the dragon kilns provided. 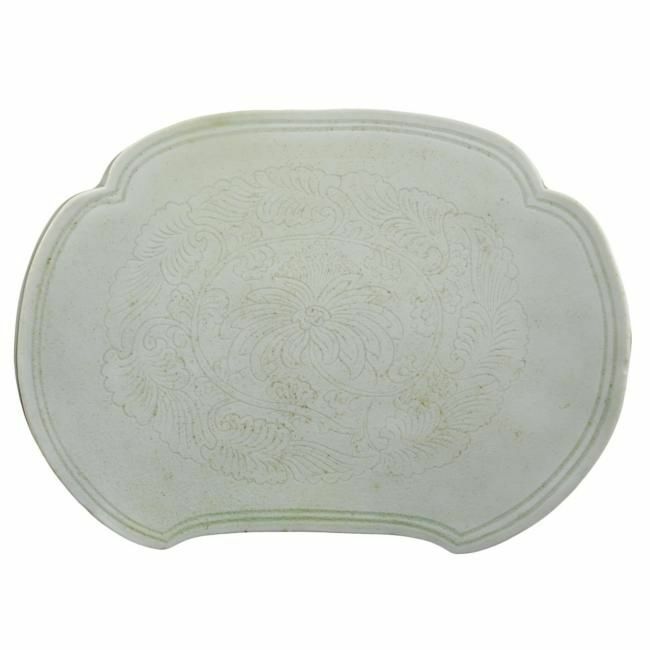 The present brushwasher in its form continues a Song dynasty vessel type produced at the official (guan) kilns located within the palace walls in the Song capital of Hangzhou, Zhejiang province. 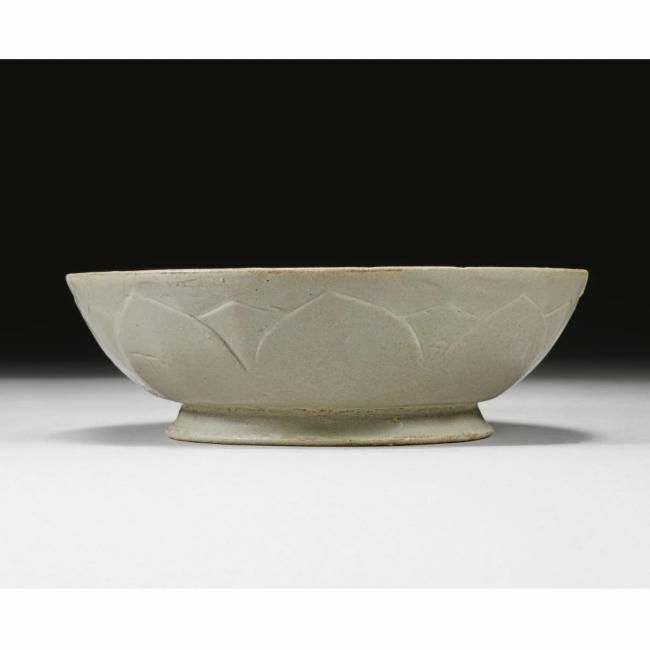 It is closely related to a 'guan' washer from the Kempe collection that has been attributed to the Song period. 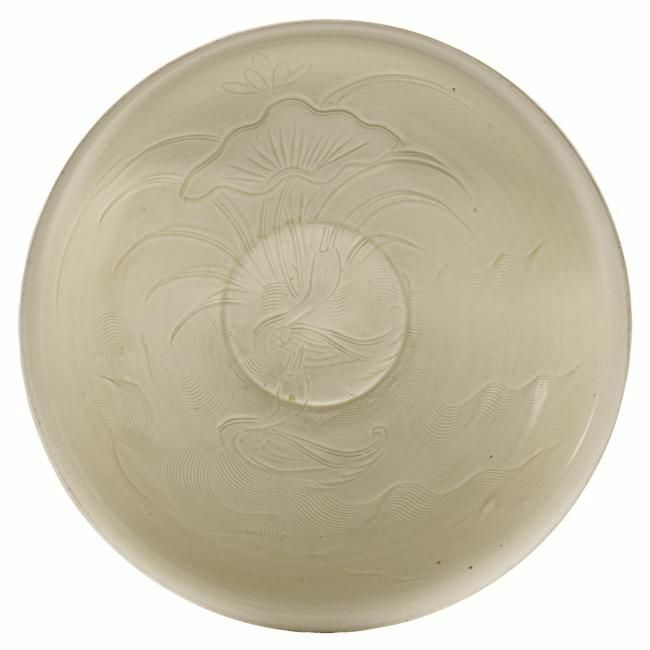 For other examples of 'ge' washers see a smaller mallow-form Song vessel from the collection of Mrs. Alfred Clark sold in our New York rooms twice, 7th December 1983, lot 207, and again, 30th March 2006, lot 30. A ten-lobed 'ge' washer of similarly large dimensions can be found in the Palace Museum, Beijing, illustrated in Zhongguo taoci quanji, vol. 8, 1999, pl. 9, together with a nine-lobed washer in the same collection, pl. 21. PROVENANCE: Collection of Alfred Clark. Sotheby's London, 25 March 1975, lot 21. Collection of the Idemitsu Museum of Arts, Tokyo. Christie's New York, 21 March 2002, lot 137. EXHIBITED: Arts de la Chine Ancienne, Orangerie de Tuileries, Paris, 1937, cat. no. 665. 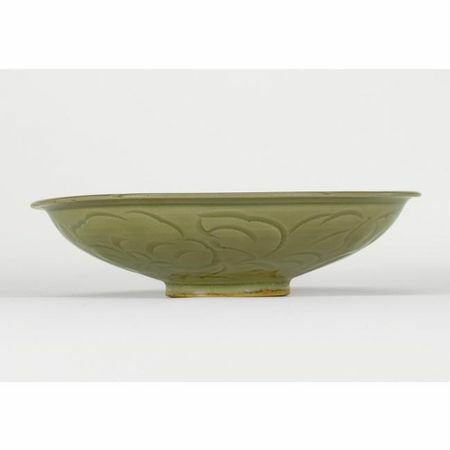 Sung Dynasty Wares. 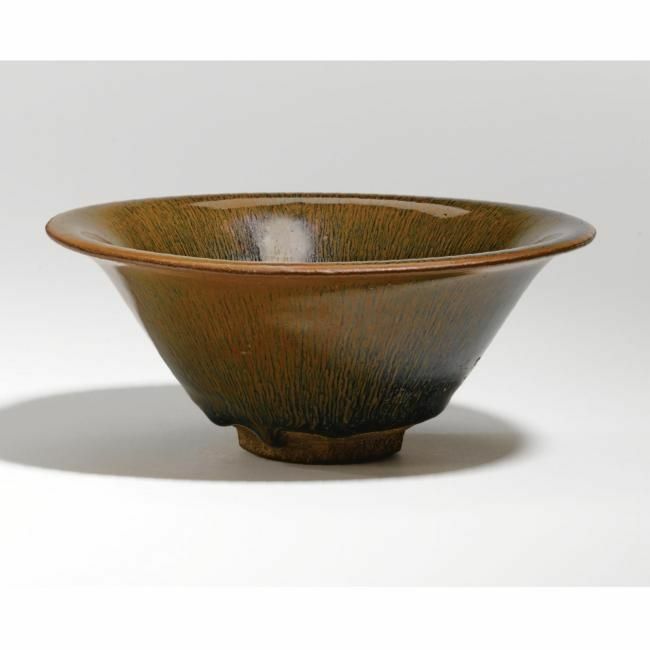 Chun and Brown Glazes, Oriental Ceramic Society, London, 1952, cat. no. 54. L'Art de la Chine des Song, Paris, 1956, cat. no. 78. Arts of Sung, Oriental Ceramic Society, London, 1960, cat. no. 69. Idemitsu Tenth Anniversary, Idemitsu Museum of Arts, Tokyo, 1976, cat. no. 103. Gendai no toji, Idemitsu Museum of Arts, Tokyo, 1979, cat. no. 75. Idemitsu Fifteenth Anniversary, Idemitsu Museum of Arts, Tokyo, 1981, cat. no. 728. LITERATURE AND REFERENCES: Chinese Ceramics in the Idemitsu Collection, Tokyo, 1987, pl. 107. Francisco Capelo et. al., Forms of Pleasure. Chinese Ceramics from Burial to Daily Life, London, 2009, pl. 35. 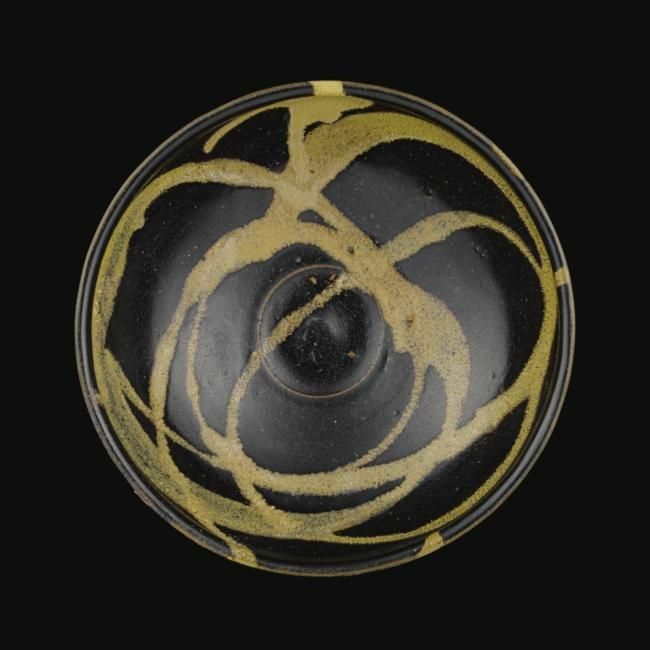 NOTE: Decorated with an irregular pattern of small splashes of iron-oxide which creates the stunning effect of small 'partridge-feather' mottles, often seen on black-glazed conical-form bowls of the Northern Song period, the present dish is unusual for its elegant flower shape. No other similar example appears to be recorded, however, the type is known from vessels covered in a deep russett-glaze, such as the dish in the Idemitsu collection included in the museum's exhibition Gendai no toji, Idemitsu Museum of Arts, Tokyo, 1979, cat. no. 76; and another slightly smaller example, from the collection of Harry Nail and later Hans Popper, included in the exhibition Song Ceramics from the Hans Popper Collection, Eskenazi, London, 1995, cat. no. 36. The elegant form of this dish is well known from 'Ding' vessels, for example see a dish of this shape and size sold in these rooms, 9th November 2005, lot 269; and a pair of dishes of slightly smaller dimensions but of closely related form, from the collection of Carl Kempe, also sold in these rooms, 14th May 2008, lot 237. 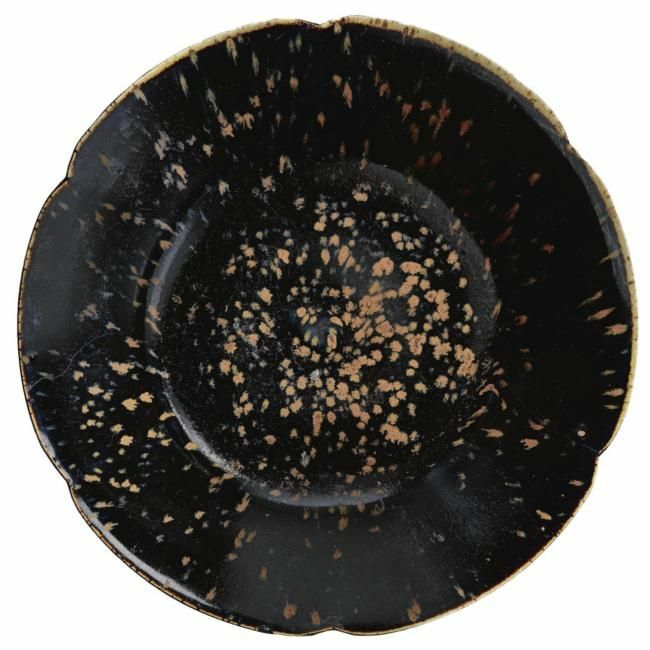 Another persimmon-glazed dish of this type is illustrated in Robert D. Mowry, Hare's Fur, Tortoiseshell and Partridge Feathers, Cambridge, Mass., 1996, pl. 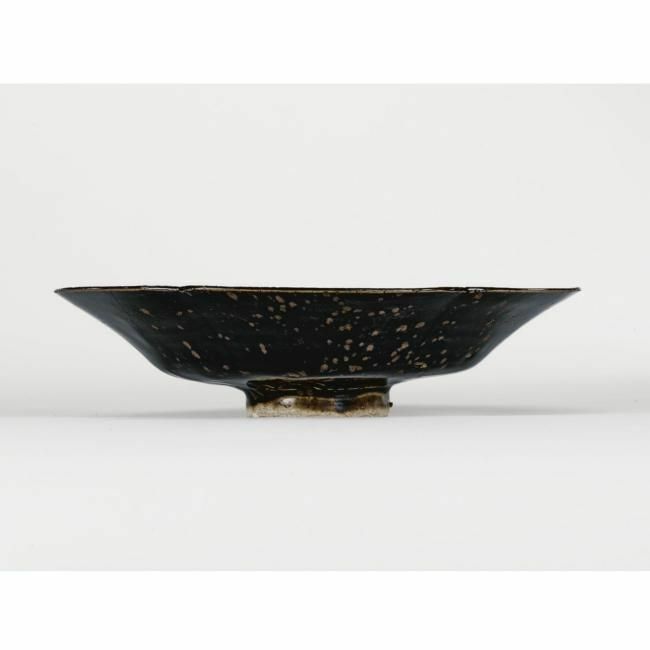 20, where Mowry on p. 119, notes that dishes of this form reflect the influence of black and dark brown lacquer vessels that were popular during the Song dynasty. He further explains that the form can be found in 'Ding' wares as well as other Northern wares, especially 'Yaozhou', with different kilns producing similar vessels for the same market. 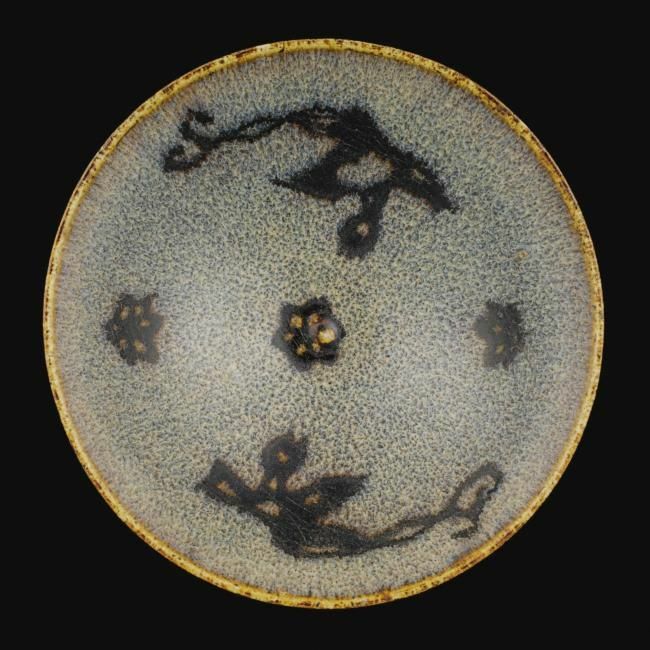 See another persimmon-glazed dish of closely related shape in the Musee Guimet, Paris, included in the Oriental Ceramic Society exhibition Arts of the Sung Dynasty, London, 1960, cat. no. 38, illustrated pl. 19; and another from the Sedgwick collection sold in these rooms 2nd July 1968, lot 108, and again, 24th July 1973, lot 8. For examples of vessels covered with partridge-feather mottles see a conical bowl, from the Hakutsuru Fine Art Museum, included in the exhibition Charm of Black and White Ware; Transition of Cizhou Type Wares, Osaka Municipal Museum of Art, Osaka, 2002, cat. no. 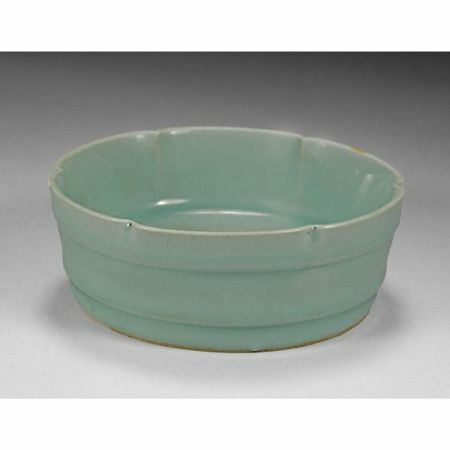 149, together with a covered bowl decorated in this manner, from the Tokyo Fuji Yurinkan, cat. no. 150. PROVENANCE: Collection of Francisco Capelo. LITERATURE AND REFERENCES: Francisco Capelo et. al., Forms of Pleasure. Chinese Ceramics from Burial to Daily Life, London, 2009, pl. 62. NOTE: Qingbai pillows are rare and the present piece is exceptional for the confidently moulded figures and exquisitely incised details. From the elegant design on the upper surface to the intricate combed curved lines that cover the body of the larger lion and the remarkable modelling of the facial features and paws of the two creatures, this piece is extremely rare and only one other pillow featuring a striding lion is known; see one with a more simplified figure of a lion illustrated in the Complete Works of Chinese Ceramics, vol. 8, Shanghai, 1999, pl. 196. Compare pillows with various figural supports, such as one made in the image of two fiercely-wrestling lions, such as one in the Palace Museum, Beijing, illustrated in The Complete Collection of Treasures of the Palace Museum. 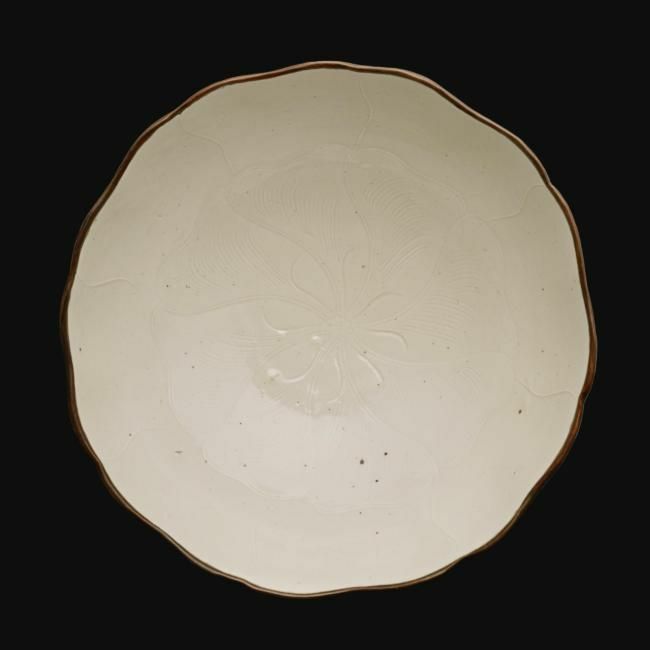 Porcelain of the Song Dynasty (II), Hong Kong, 1996, pl. 155; another modelled with two fighting dragons, sold in these rooms, 7th June 2000, lot 103; and a third with the support in the form of a reclining lady, in the Metropolitan Museum of Art, New York, included in Oriental Ceramics. The World's Great Collections, vol. 12, Tokyo, 1977, pl. 23. The lion on the present pillow embodies the attributes of both male and female through its brocade ball and cub respectively. 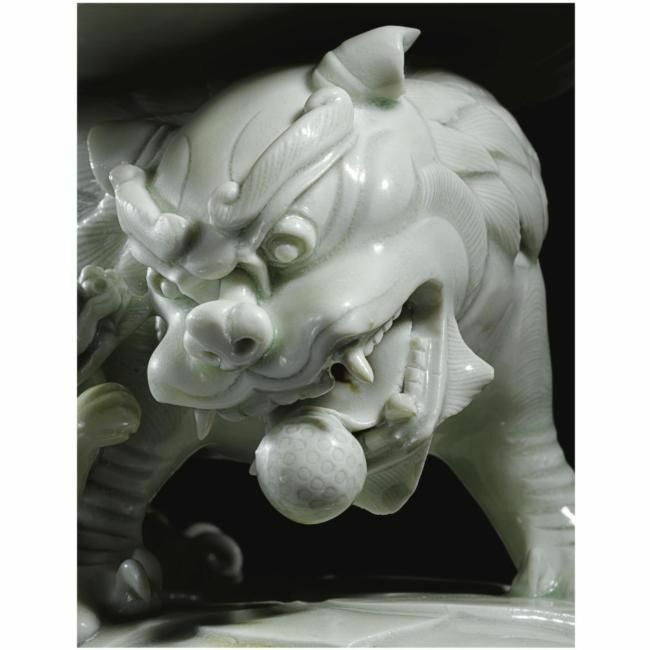 The fierce expressions, bushy eyebrows, triangular teeth, and delicate rendering of fur are characteristic of figures of lions made in the Hutian kilns of Jingdezhen. 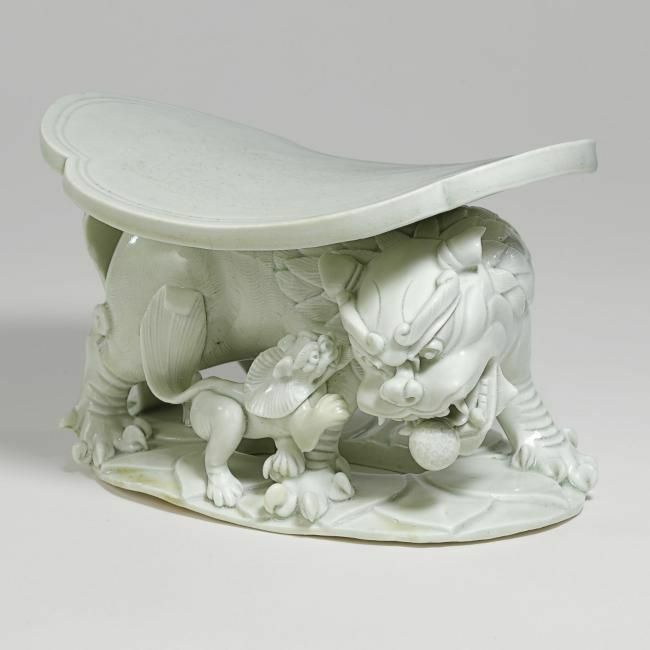 For an incense burner in the shape of a seated lion, see one published in Chai Kiln and Hutian Kiln, Guangzhou, 2004, p. 70; and a figure of a Buddhist lion with a brocade ball, in the Ashmolean Museum, Oxford, included in Stacey Pierson (ed. ), Qingbai Ware: Chinese Porcelain of the Song and Yuan Dynasties, London, 2002, pl. 116. PROVENANCE: The R.E.R. Luff Will Trust. Sotheby's London, 26th June 1973, lot 17. Christie's New York, 21st March 2002, lot 127. 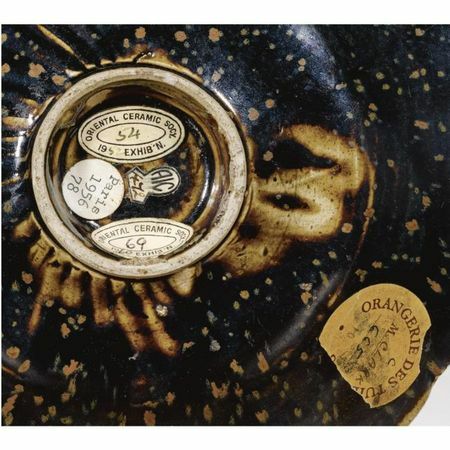 EXHIBITED: The Ceramic Art of China, Oriental Ceramic Society Jubilee Exhibition, London, 1971, cat. no. 67. LITERATURE AND REFERENCES: Francisco Capelo et. al., Forms of Pleasure. Chinese Ceramics from Burial to Daily Life, London, 2009, pl. 36. NOTE: Although 'Ding' bowls with this charming decoration of a pair of ducks in a lotus pond that is rich in symbolism with the ducks representing connubial bliss and loyalty and the pond itself a rebus for harmony and purity are known, the present example is especially fine in its potting and decoration. The well defined deep carving of the design is noteworthy, insinuating that the vessel was made for a special occasion, possibly as a wedding gift. 'Ding' wares are generally thinly potted, as seen on the present vessel, with a fine body which does not require a slip to appear white after firing. 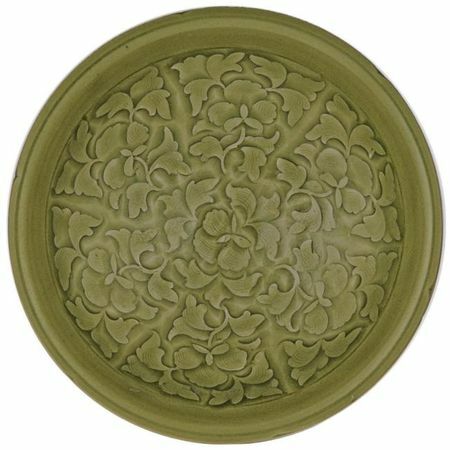 It is covered in an ivory-coloured glaze which runs down in somewhat darker 'tears' characteristic of the best 'Ding' examples. A slightly smaller bowl of more rounded form with the duck design, in the National Palace Museum, Taipei, was included in the museum's Special Exhibition of Ting Ware White Porcelain, Taipei, 1987, cat. no. 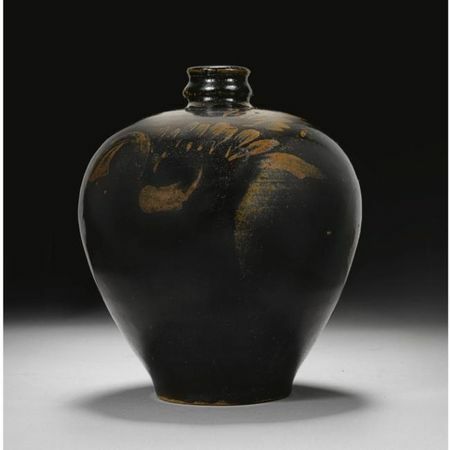 44; another from the collection of Lucy Maud Buckingham was exhibited in Masterpieces of Chinese Arts from the Art Institute of Chicago, Museum of Oriental Ceramics, Osaka, 1989, cat. no. 67; and a third, probably also of this type from the Ginsberg collection, was exhibited in the Ausstellung Chinesischer Kunst, Berlin, 1929, cat. no. 595. Compare also a bowl sold in these rooms, 10th June 1997, lot 14. PROVENANCE: Collection of Robert Chang. Christie's New York, 21st March 2002, lot 150. 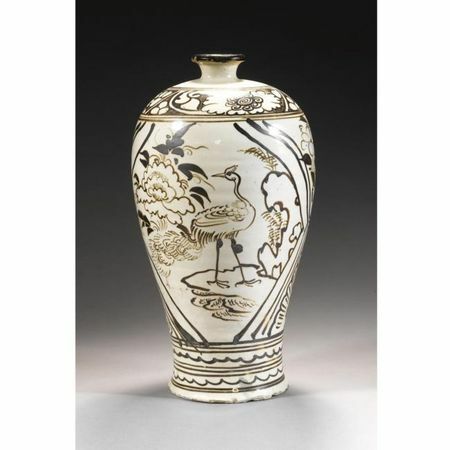 EXHIBITED: An Exhibition of Important Chinese Ceramics from the Robert Chang Collection, Christie's, London, 1993, cat. no. 4. LITERATURE AND REFERENCES: Francisco Capelo et. al., Forms of Pleasure. Chinese Ceramics from Burial to Daily Life, London, 2009, pl. 56. 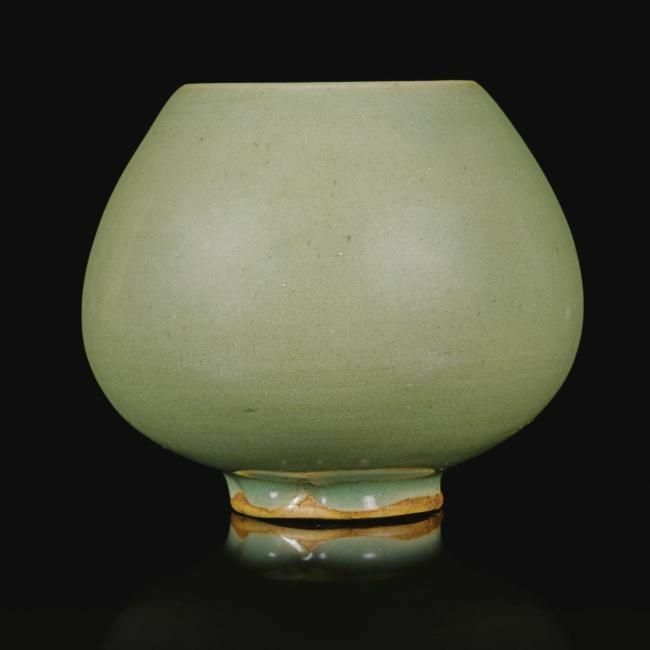 NOTE: 'Jun' lotus bud waterpots of this elegant form and distinctive opalescent glaze are held in major public and collections worldwide; see one of this size, from the British Rail Pension Fund and exhibited on loan at the Dallas Museum of Art between 1985-1988, sold in these rooms, 12th December 1989, lot 85; another in the Baofeng County Cultural Relics Bureau, published in Ruyao de xin faxian, Beijing, 1991, pl. 107; and a third example in the Meiyintang Collection illustrated in Regina Krahl, Chinese Ceramics from the Meiyintang Collection, vol. 1, London, 1994, pl. 393, together with a vessel of this form but decorated with purple splashes, pl. 392. Compare also a water pot in the Shanghai Museum included in Chugoku toji zenshu, vol. 12, Kyoto, 1983, pl. 30; another in the Metropolitan Museum of Art, New York, published in Suzanne G. Valenstein, A Handbook of Chinese Ceramics, New York, 1989, pl. 79; and one sold in these rooms, 12th December 1989, lot 236. 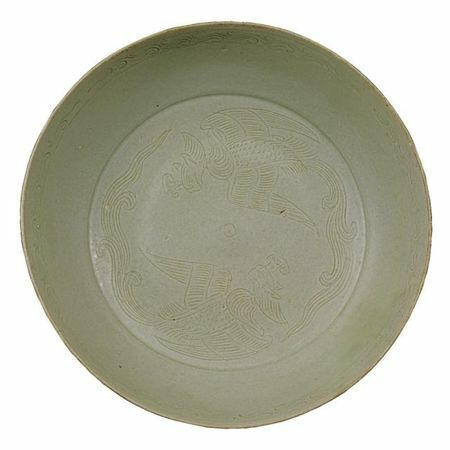 Together with 'guan', 'ge', 'Ru', and 'Ding' wares, 'Jun' ware forms one of the 'five famous wares of the Song dynasty' as grouped by later collectors. 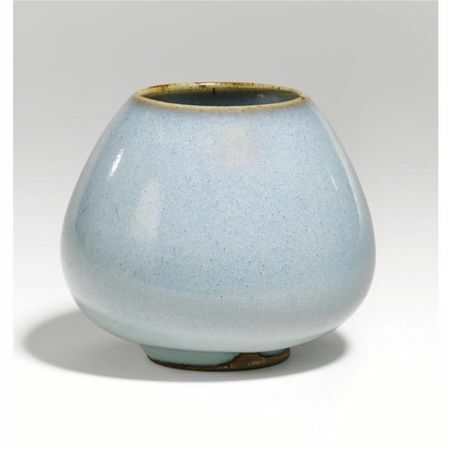 Its heavy potting and thick glaze best lent itself to simple, fluid forms; and with its well-proportioned shape coupled with the even opalescent pale blue glaze the present waterpot is a fine example of this type of ware. PROVENANCE: Toguri Museum of Art, Tokyo. Sotheby's London, 9th June 2004, lot 49. LITERATURE AND REFERENCES: Francisco Capelo et. al., Forms of Pleasure. Chinese Ceramics from Burial to Daily Life, London, 2009, pl. 37. NOTE: Although the form and design elements of this piece are well known from the repertoire of 'Yaozhou' celadons, the motif found on this exquisitely carved vessel remains rare. 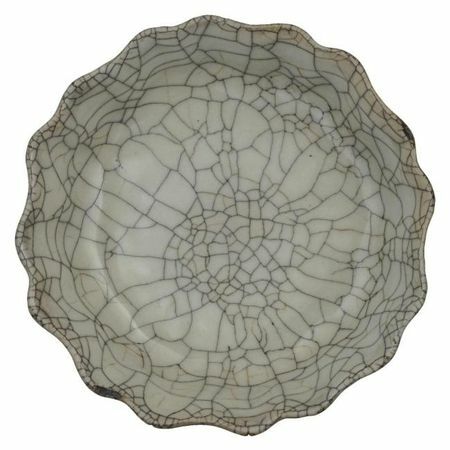 A closely related shallow bowl excavated from the 'Yaozhou' type site is illustrated in a line drawing in Songdai Yaozhou yaozhi/The Yaozhou Kiln Site of the Song Period, Beijing, 1998, p. 204, fig. 106; 12 and pl. 50, fig. 6. The Song wares from Huangbaozhen, Tongchuan county in Shaanxi province, the area formerly known as 'Yaozhou', are characterized by deep olive-green glazes and carved decoration as seen on the present vessel. Each vessel is distinct since the glaze has a tendency to pool to a deeper tone in the recessed areas. 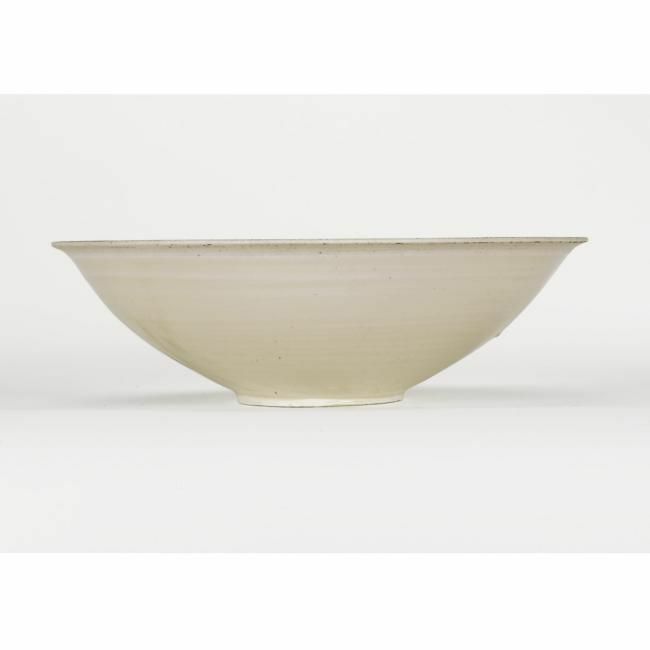 The type site has produced a vast variety of shapes and designs, although the majority are utilitarian pieces such as bowls, dishes and smaller upright forms. For examples of 'Yaozhou' bowls decorated with peony spray see one included in the exhibition Iron in the Fire, Ashmolean Museum, Oxford, 1988, cat. no. 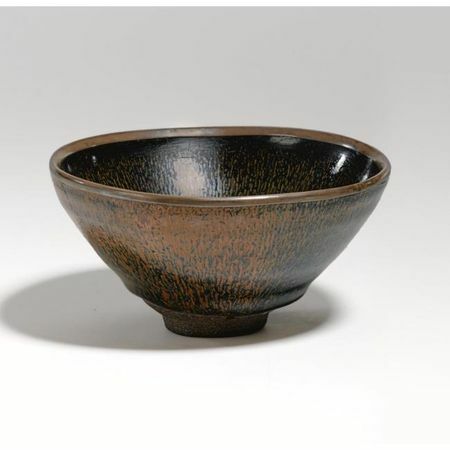 21; and another published in Masterpieces of Yaozhou Ware, Osaka, 1997, p. 50, no. 64. 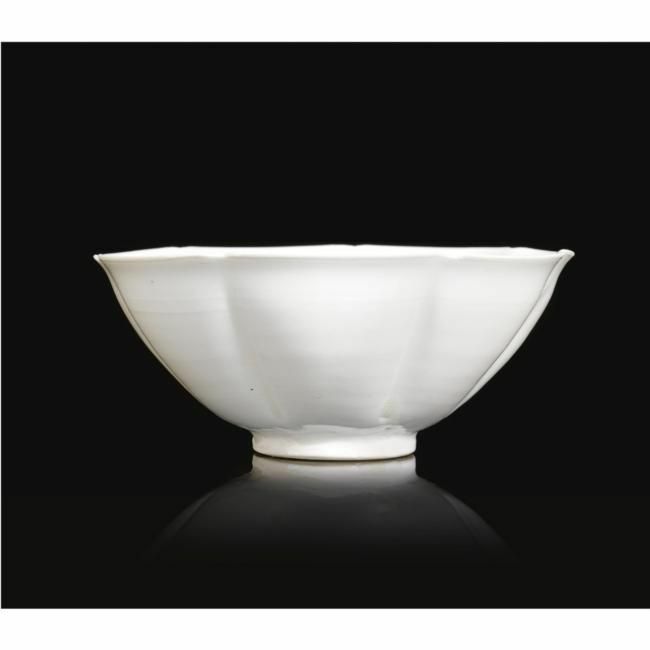 Compare also a bowl sold in our Hong Kong rooms, 21st May 1984, lot 38; and another sold in these rooms, 10th December 1985, lot 166. LITERATURE AND REFERENCES: Francisco Capelo et. al., Forms of Pleasure. Chinese Ceramics from Burial to Daily Life, London, 2009, pl. 57. 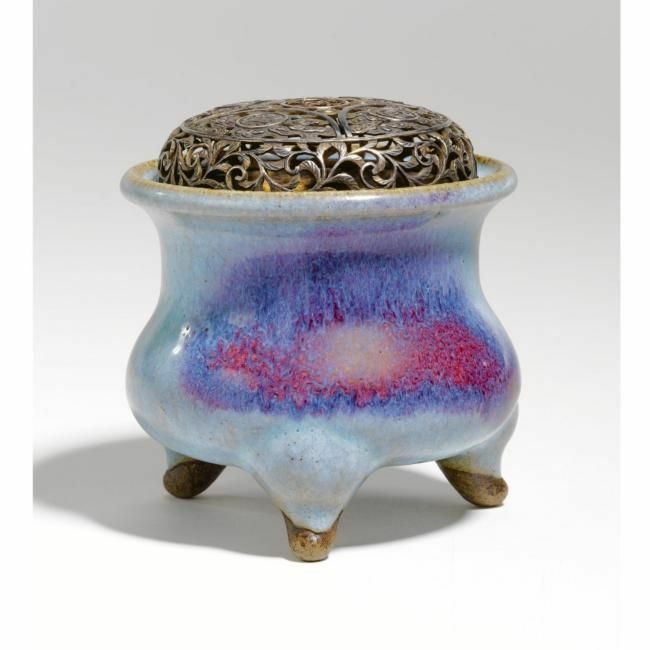 NOTE: The present 'Jun' tripod censer, with its thick luminous glaze and restrained use of brilliant purple splashes, is a fine example of its type. 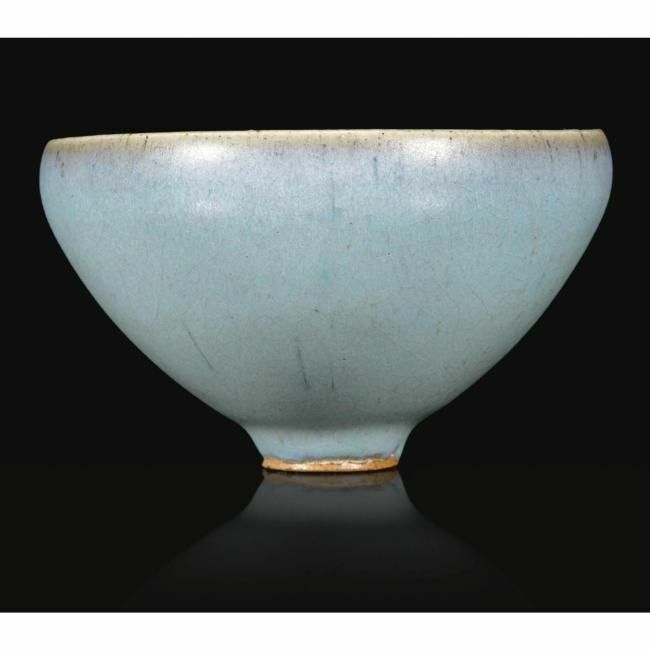 Wares from the typesite Juntai in Yu county, Henan province, an area formerly known as Junzhou, are remarkable for their luscious thick glaze of intense colouration which can vary from light to deep turquoise blue. In the early twelfth century potters began applying splashes of deep purplish-red derived from copper to the glaze before firing, resulting in patches of purple, lavender and tones of deep blue on the primary milky-blue glaze. 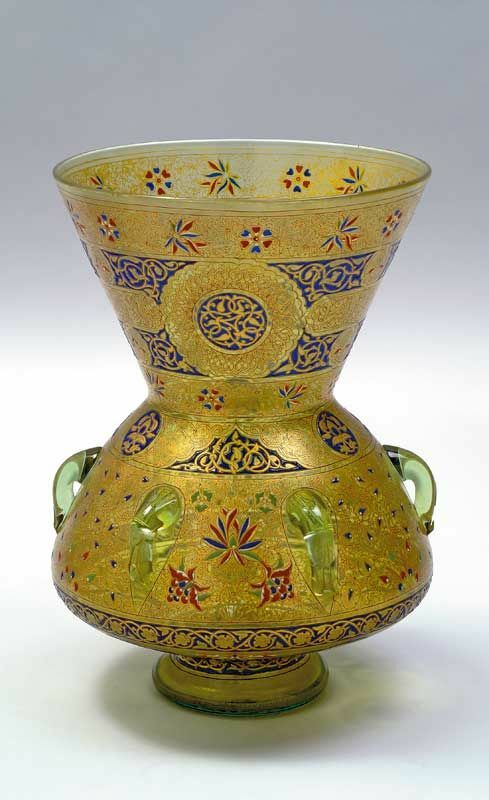 As seen on this censer, such splashes added a flamboyant effect to the piece, often with a strong calligraphic quality which had an immense appeal to the literati and nobility of the time. A censer of related form and size, but profusely splashed with brilliant tones of purple, from the Muwen Tang collection and included in the exhibition Song Ceramics from the Kwan Collection, Hong Kong Museum of Art, Hong Kong, 1994, cat. no. 42, was sold at Christie's London, 8th June 1987, lot 49, and again in these rooms, 12th November 2003, lot 49. A slightly larger example is illustrated in John Ayers, The Baur Collection, vol. 1, Geneva, 1968, pl. 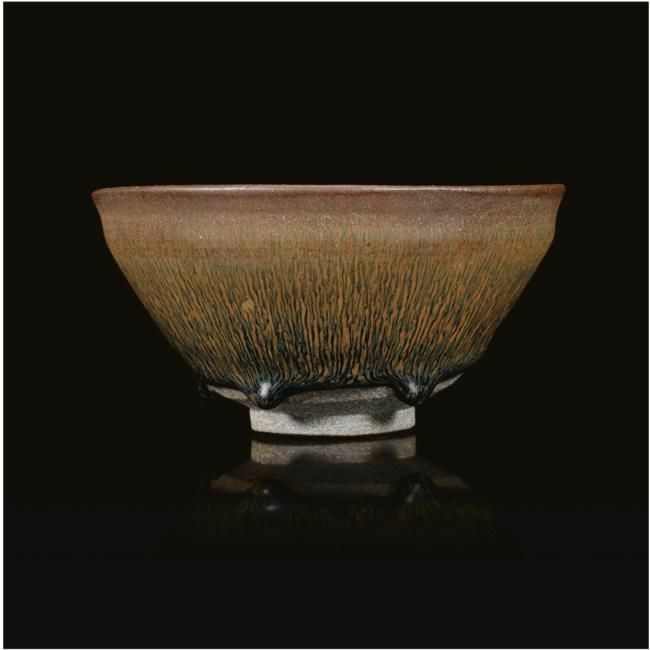 A37; another from the Dexingshuwu collection, was sold in our New York rooms, 18th March 2008, lot 90; and a third example from the Schoenlicht collection, is published in H.F.E. Visser, Asiatic Art in Private Collecions of Holland and Belgium, Amsterdam, 1947, pl. 232. Compare also a larger censer of this form, glazed with a deep purple on the body and feet, illustrated in Regina Krahl, Chinese Ceramics from the Meiyintang Collection, vol. 1, London, 1994, cat. no. 394. This censer derives from the archaic bronze liding, a ritual vessel used from the Shang to the Han dynasties (16th century BC-220 AD) and reflects the interest in antiquity amongst members of the educated elite. The literati of the day formed collections of ancient bronzes, which were used only on special occasions to prevent them from wear and damage; thus, contemporary vessels of bronze and ceramic based on antique models were commissioned. PROVENANCE: R. & V. Tregaskis Oriental Antiques Ltd., Sydney. PROVENANCE: Christie's New York, 21st March 2002, lot 146. LITERATURE AND REFERENCES: Francisco Capelo et. al., Forms of Pleasure. Chinese Ceramics from Burial to Daily Life, London, 2009, pl. 49. PROVENANCE: Emil Hultmark (by repute). NOTE: A related brushwasher, but of larger proportions, in the Nakamura Kinenkan Museum, Kanazawa, is illustrated in Sekai toji zenshu, vol. 12, Tokyo, 1977, pl. 78; a smaller example covered in a crackled glaze, in the National Palace Museum, Taipei, is published in the Illustrated Catalogue of Sung Dynasty Porcelain in the National Palace Museum. Lung-ch'uan Ware, Ko Ware and Other Wares, Taipei, 1974, col. pl. 78; and a third slightly smaller example was sold in our Hong Kong rooms, 5th November 1997, lot 1382. 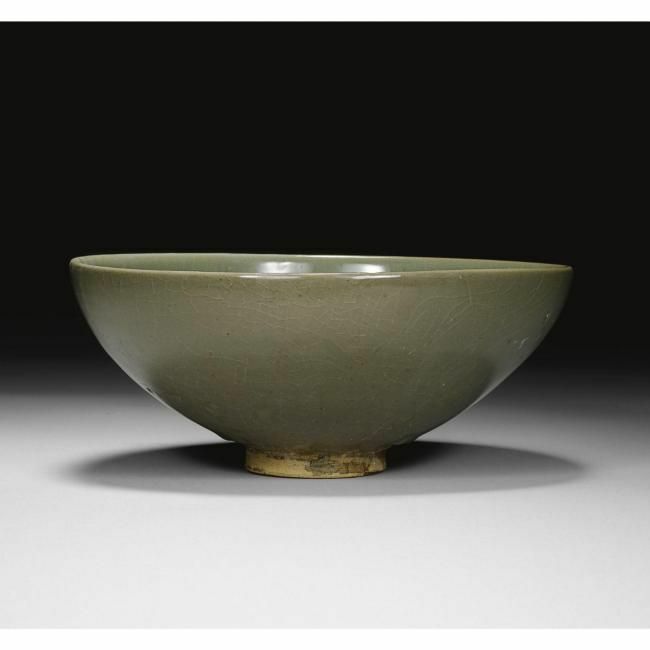 PROVENANCE: Sotheby's New York, 20th March 2002, lot 113. LITERATURE AND REFERENCES: Francisco Capelo et. al., Forms of Pleasure. Chinese Ceramics from Burial to Daily Life, London, 2009, pl. 65. 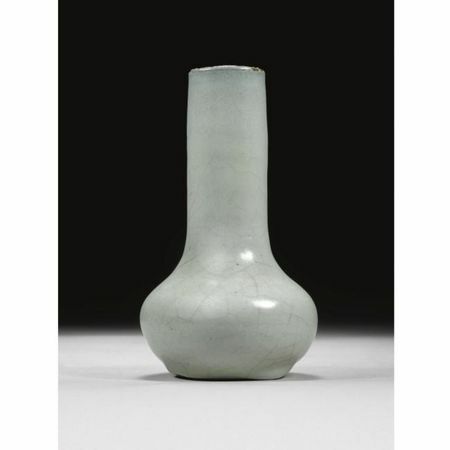 NOTE: 'Longquan' vases of this type are described by Julian Thompson, 'Chinese Celadons', Arts of Asia, November-December 1993, p. 62, as belonging to the finest 'Longquan' celadon vessels recorded. The glaze of this vase is a lustrous bluish-green and the modelling of the dragon coiled around the vessel is powerful and lively. The bird on the cover also appears animated with its head lifted alert to attention and wings slightly lifted to suggest imminent movement. Compare vases of similar form and decoration, such as one from the Avery Brundage collection in the Asia Art Museum, San Francisco, published in Mary Treagar, Song Ceramics, New York, 1982, pl. 286; another included in the Illustrated Catalogue of Tokyo National Museum. Chinese Ceramics, vol. 1, Tokyo, 1988, pl. 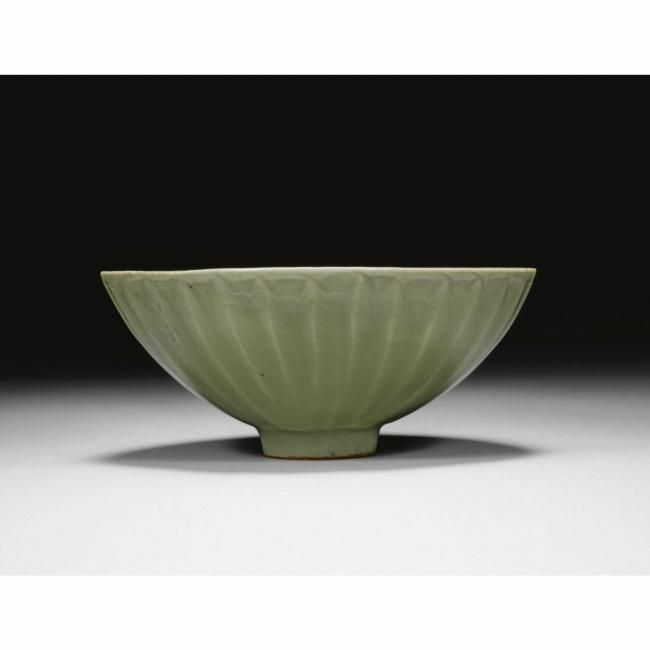 509; one excavated in Longquan and now in the Wenzhou Museum, included in Zhu Baiqian, Celadons from Longquan Kilns, Taipei, 1998, pl. 105. A related vase, from the collection of Stephen D. Winkworth, was sold in these rooms, 25th April 1933, lot 92; and another, included in the exhibition Decouverte de L'Asie, Hommage a Rene Grousset, Musee Cernuschi, Paris, 1954, was sold in these rooms, 1st July 1969, lot 120. 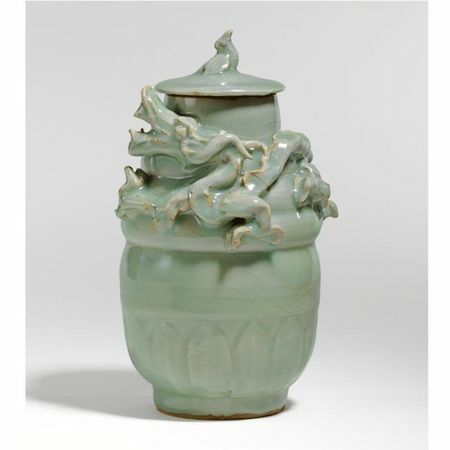 It is thought that funerary jars of this type were made in pairs, one bearing the 'green dragon' of the East and the other the 'white' tiger of the West. A pair from the Sir Percival David collection, and now in the British Museum, London, is illustrated in Margaret Medley, Illustrated Catalogue of Celadon Wares, London, 1977, pl. IV, no. 36, where Medley notes that these vases may have been filled with aromatic oils and then placed next to the deceased whose head would have faced the north. PROVENANCE: Collection of Johannes Hellner, Stockholm. Sotheby's New York, 20th March 2002, lot 106. LITERATURE AND REFERENCES: Francisco Capelo et. al., Forms of Pleasure. Chinese Ceramics from Burial to Daily Life, London, 2009, pl. 55. 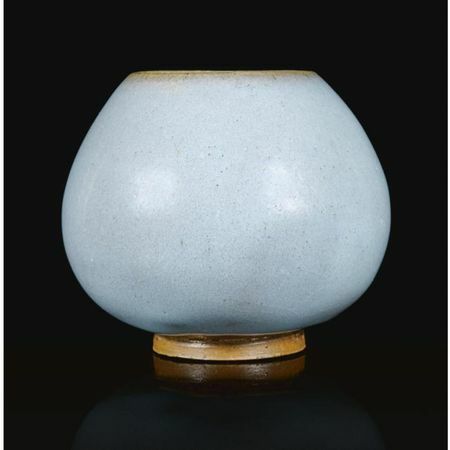 NOTE: A slightly larger 'Jun' bowl of this unusual shape, covered in a lavender-blue glaze suffused with specks of purple, from the Toguri collection, was sold in these rooms, 9th June 2004, lot 59; and another is illustrated in Michael Sullivan, Chinese Ceramics, Bronzes and Jades in the Collection of Sir Alan and Lady Barlow, London, 1963, pl. 35c. PROVENANCE: Sotheby's New York, 25th May 1944, lot 345. Yamanaka & Co., New York. Collection of Mildred R. and Rafi Y. Mottahedeh. Sotheby's New York, 20th September 2000, lot 96. EXHIBITED: The Animal in Chinese Art, Oriental Ceramic Society, London, 1968, no. 439, pl. 13, fig. B. 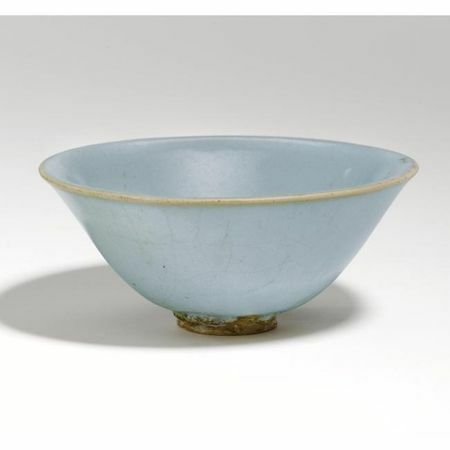 NOTE: See a meiping formerly in the Howard Hollis collection and included in the exhibition Chinese Ceramics from the Prehistoric Period through Ch'ien-Lung. A Loan Exhibition from Collections in America and Japan, Los Angeles County Museum, Los Angeles, 1952, cat. no. 216; another 'Cizhou' vase of this type boldly painted in dark brown with an animated dragon amidst spiral clouds, sold in our New York rooms, 18th September 1996, lot 184; and a third example, painted with figures, from the collection of Gustaf Hillestrom and included in the exhibition Kina som Hobby, Ostasiatiska Museet, Stockholm, 1968, cat. no. 27b, sold in these rooms, 16 December 1980, lot 533. 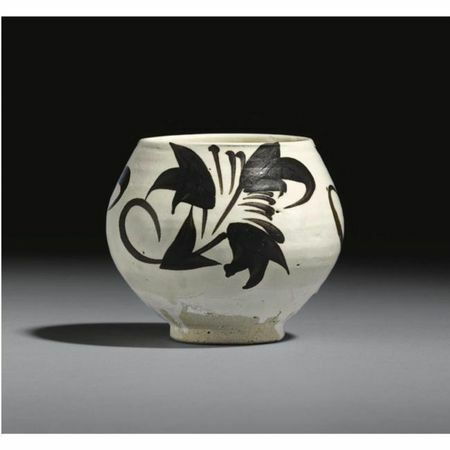 The bird and flower motif can be found on a 'Cizhou' guan jar from the collection of Thos. Barlow Walker, sold in our New York rooms, 26th September 1972, lot 696. Compare also a jar painted with phoenix, excavated from the ruins of the Yuan capital Dadu, modern Beijing, included in the exhibition Archaeological Treasures Excavated in the People's Republic of China, Tokyo National Museum, Tokyo, 1973, cat. no. 228. 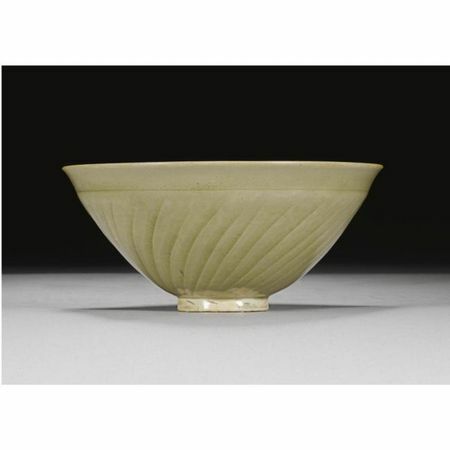 NOTE: Bowls of this shallow form and decoration are rare and only one other example appears to have been published, in the Sir Percival David Collection in the British Museum, London, included in the exhibition Imperial Taste. Chinese Ceramics from the Percival David Foundation, Los Angeles County Museum of Art, Los Angeles, 1989, cat. no. 3. A shard from a bowl with the same design of phoenixes, excavated at the Yue kilns in Zhejiang province, was included in the exhibition Kiln Sites of Ancient China. Recent Finds of Pottery and Porcelain, British Museum, London, 1980, cat. no. 52. The form and decoration of this piece appears to have been inspired by Tang dynasty gold and silver vessels. 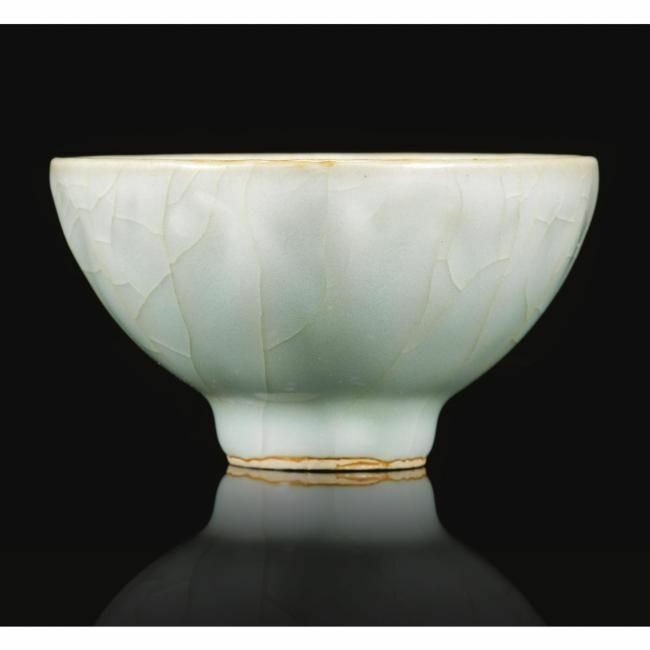 The broad overlapping lotus leaves on the exterior and the splayed foot are reminiscent of bowls such as a gold bowl excavated in 1970 at Hejiacun, Xi'an, Shaangxi province, illustrated in National Treasure Collection of Rare Cultural Relics of Shaanxi Province, Xi'an, 1998, p. 25; while the linear style of the finely incised birds is associated with the engraved phoenixes, as seen on the interior of a silver bowl, ibid, p. 27. This bowl belongs to the fine group of 'Yue' wares produced during the 9th and 10th centuries, which are characterised by their delicate potting and exquisite jade-like glazes known as mise ('secret colour') wares. These wares were celebrated in Chinese literature and sent as tribute to the Tang court and included in imperial donations to Buddhist temples at the time. LITERATURE AND REFERENCES: Francisco Capelo et. al., Forms of Pleasure. Chinese Ceramics from Burial to Daily Life, London, 2009, pl. 48. PROVENANCE: Hugh M. Moss Ltd., London, 1971.